On Sunday I preached a message on The Faithful Priest (1 Samuel 2:12-36). The climax of the passage is the prophetic prediction by the “man of God” that the Lord would raise up to himself “a faithful priest.” I noted in my message that this prediction had a preliminary temporal fulfillment in the rise of Samuel (and perhaps the later Zadokite priesthood) but only met its ultimate fulfillment in the coming of Christ, who is the faithful Priest (cf. Hebrews 10:11-13). 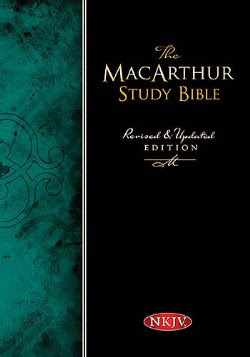 After the service a CRBC member who was using the MacArthur Study Bible (NKJV) pointed out MacArthur’s notes on 1 Samuel 2:35 (p. 381). MacArthur comments, “I will build him a sure house. The sons of Zadok will also serve in the millennial temple (see Ezek. 44:15; 48:11). My anointed. This refers to the messiah who will defeat God’s enemies and establish His rule in the Millennium (see v. 10).” MacArthur has to bend his interpretation of the text to fit it into his millennial eschatological scheme despite the fact that there is no explicit reference here to “the millennium.” In particular, he makes the reference to a “sure house” to be a reference to the “millennial temple,” a point that is far from apparent on the level of plain sense interpretation. From a messianic perspective “the sure house” is more likely a reference to the New Covenant church (see 1 Peter 2:5: “you also, as living stones, are being built into a spiritual house”) or to the body of Christ itself (see John 2:22: “But he was speaking of the temple of his body”). Again, fitting this text into the dispensational scheme requires tortured exegesis. This verse raises another interesting question about translation. The NKJV capitalizes the first letter in references to the Deity, including pronouns (e.g., He, Him, etc.). The rendering of the NKJV of 1 Samuel 2:35b is, “I will build him a sure house, and he shall walk before My anointed forever.” If this is a messianic prediction, however, that finds its ultimate fulfillment in Christ, as I have argued, one might contend that the pronouns “him” and “he” here should be capitalized. This raises the general problem with piety driven attempts to capitalize references to the Deity. It frequently involves interpretation rather than translation. The original language texts (in both Hebrew and Greek) did not attempt to make use of such capitalization, and translations do best to follow their lead and leave interpretation to the reader. The Vision (12/30/10): Not Saved! Season's Greetings from the Riddles! The Vision (12/16/10): Live as Kings! Textual Note: "Beor" or "Bosor" in 2 Peter 2:15?